Now that all of our friends and family should have received their card in the mail, I think it's safe to share! I didn't want to ruin the surprise for those getting their card from us this year. 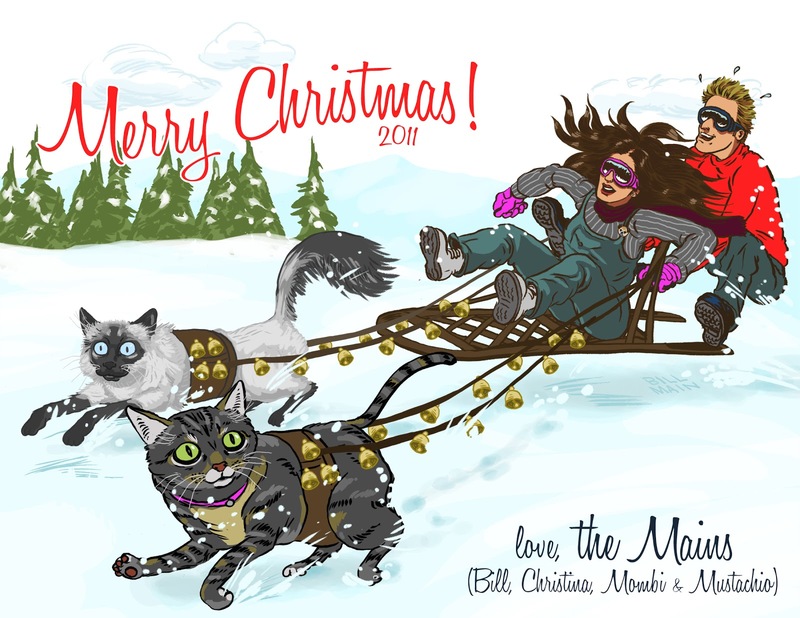 Every year since we've been married, my fabulous husband and I conjure up a fun and unique Christmas card for him to illustrate. This is our 3rd card we've done and we both think it's the best one yet! Let me be honest, I actually don't have very much to do with the card making process other than a teensie suggestion or two at the beginning. He then takes that thought and runs wild with it. For example, with this year's card I said "Maybe you and I could be pulled through snow by sled cats...?" And viola! Here we are. Not just any sled cat team, our sled cat team! Our crazy fluffy "baby kitty", Lady Mustachio of Denison (aka Mustachio) is accompanied by her older (and much more laid back) sister, Princess Mombi (aka Mombi). Decked out in loads of jingle bells, pink collars, and harnessed up, they are pulling us through the snow! I imagine we're going somewhere super fun, filled with family and fire places and hot cocoa. Personally, we both felt after all was done and printed, that Mombi girl should have been a bit plumper in size...but what can you do? As my mom said, "Her harness is holding her in"...Yeah we'll go with that. This now tradition of ours came from a tradition my grandmother used to do. Every single year beginning when my mom and her family were young, my grandmother would illustrate their family's Christmas greeting card. It was actually kind of nice to see when I was old enough to understand- first it was the 5 of them, (maybe one year on a plane because they had gone somewhere fun that year), maybe one of the kids as a baby...Then as the years went on you saw my dad enter into the cards, then baby me...then my sister, etc. Very very fun. The one I remember the most is all of my family as Native Americans, sitting around a fire with feathers in their hair (I think it's a fire) with my mom and dad included. On my mom's back is one of those wrap things with a little baby me inside all snuggled up. I'm trying to find a picture on Google right now of what I'm talking about...something like this! Use your imagination! Anyway, it was such a great idea that when I began to have a little family of my own (you know...me, hubbie, our dog who has since passed, and our two kitties) I knew it was one tradition I wanted to keep going. And so we did. Every year my husband creates these fun and very "us" cards to send out to family and friends all around. This year we even sent some to Norway and Trinidad! Phew! So from my family to yours: Merry Christmas!! Love, the Mains!